The National Environmental Policy Act (NEPA), one of America's first comprehensive environmental laws, requires federal agencies initiating "major federal actions significantly affecting the human environment" to first prepare an Environmental Impact Statement (EIS). Although the statute does not require the agency to follow any recommendations or mitigation measures included in an EIS, the requirement has given strength to environmental causes by a) establishing a public record of a project's potential environmental impacts and b) providing a basis to slow or prevent a major federal action if the EIS is ignored or insufficient. In response to a permit application from Cape Wind Associates, the Army Corps of Engineers has prepared a draft EIS for the proposed Cape Wind project off the coast of Massachusetts. It's hundreds of pages long, and includes information on the farm's potential impacts on everything from sediment to recreation to shellfish and, of course, birds. 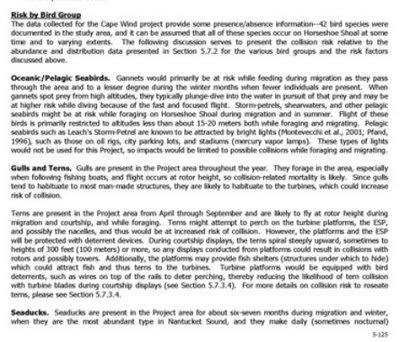 Reading through the section on possible impacts to birdlife makes me feel very happy that someone is putting so much thought into this. 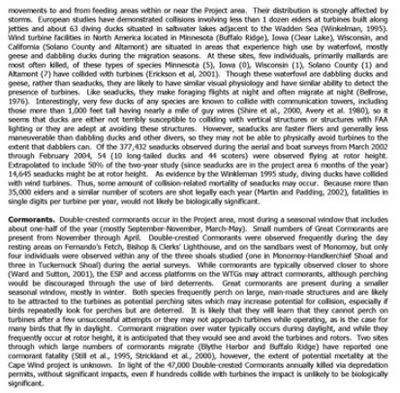 As I have said on this blog before, the issue of birds and turbines is much more complicated than many non-birders initially think it to be. Potential threats vary from family to family or species to species, depending on each of their individual behaviors. This EIS does, I think, a great job of laying out what is different about each group of birds and how an offshore wind farm may affect them. At California’s Altamont Pass, thousands of birds are slaughtered by spinning wind turbine blades every year, despite efforts at adaptive management. If this technique does not work for land-based wind, how could it work for an offshore project like Cape Wind? 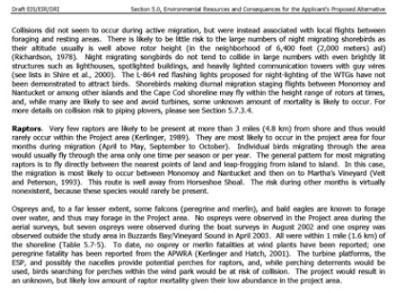 clearly misses the fundamental point (as laid out in detail in Section 5.7.2.2.1 of the DEIS) that the comparative risk to birds from the Cape Wind project and the existing Altamont Pass site are very different. Like it or not, birdwatchers are not the only group of people out in the woods looking for birds. Every year, millions of Americans participate in a sport that long predates recreational birding: bird hunting. Millions of individual birds are taken annually, and the range of species includes turkey, grouse, dabbling ducks, sea ducks, mergansers, mourning doves, rail, coot and more. Birdist: When did you start bird hunting? What birds do you currently hunt? The Rabid Outdoorsman: I suppose mine is a classic tale of being introduced into hunting from a very young age. First following along behind Dad as he hunted for grouse and woodcock and then progressing to using a BB gun to learn proper gun handling techniques. As I aged, I progressed to more powerful gauge firearms and finally began going out on my own by the age of 14. In my current phase of hunting, I have incorporated the use of a dog that adds an entirely new level of hunting enjoyment. Not only is she a loving and faithful companion but she also aids in the discovery and recovery of game. I currently hunt or have hunted all legal game birds. Were you interested in birds before you started hunting them, or did hunting lead you to birds? I have always been interested in all animals big and small. I remember as a kid my brother and I had an old TV that was gutted and fitted with a Plexiglas front that we filled with bird nests, animal skulls and small fake birds we would buy in craft stores. Hunting to me is another outlet used for enjoying the outdoors as much as the other pursuits I enjoy such as fishing, rock climbing/mountaineering, photography, hiking or kayaking. Can you briefly describe some different hunting techniques for hunting different birds? Volumes of books have been written concerning this question. A majority of the fun associated with hunting is that you are constantly trying to outsmart the game animals you are pursuing. I currently hunt turkeys, grouse, snipe, woodcock, sea and puddle ducks. Each of these endeavors requires a completely different skill set. Just hunting turkey will vary in technique depending if it is spring or fall, hunted with bow or gun, from a blind or by actively stalking. If there is one “technique” that not enough hunters understand it is that one must thoroughly scout outside of hunting seasons to determine where game animals are in the highest densities. Unfortunately most hunters do not invest enough time in this most critical of steps and seriously negatively impacts their success rate. What is the process in Maine for someone to become a bird hunter? An individual who wishes to begin bird hunting should first take a “Hunter Safety Course”. Bottom line is that attendance at these now mandatory courses have saved countless lives since their inception. Interested individuals should also hunt for their intended species with a licensed Maine guide or a competent and safe hunting companion that knows how to successfully hunt for that game animal. Scheduled youth hunting days are also a great option for kids under 16 as they allow kids to hunt in the woods during periods of time when adults are unable. In theory this allows game animals to be much more plentiful, available and less pressured. What does a hunter do with his killed birds? If he eats them, does he eat ALL of them? Ethically killing for the sake of killing is not hunting. For many individuals outside of the hunting world I think this is an extremely difficult concept to grasp. Hunting is much more than pulling a trigger it is about an individuals primal connection back to the woods and waters as a source of sustenance that dates back a million years. Legally Maine has a “Wanton Waste” law that requires hunters to consume all reasonable parts of every game animal. Additionally, hunters legally can only be in possession of a certain number of game birds (same as daily bag limit) so they must be immediately eaten. Aside from the “law” a good hunter has an obligation to eat what he kills. I almost hate to ask this as a birder, but what do they taste like (and you can't just say "like chicken!")? What are the different tastes between categories of game birds (i.e., grouse v. ducks)? Do freshwater ducks taste different than sea ducks? Do, say, Green-winged Teal taste different than Blue-winged Teal? The tastes are unique and varied with every species having different and unique textures, tastes and aromas. As an “outdoor” chef you need to maximize the positives and minimize the negatives. Obviously some species are more desirable to eat than others. Sea ducks and mergansers (fish and mussel eaters) are at the low end while wood ducks (acorn eaters) and teal are at the higher end. I personally have different recipes for every different game animal depending on its specific culinary qualities. Turkey is typically deep fried in peanut oil, sea ducks and mergansers are combined with pork and beef and made into sausage links that I then hickory smoke, grouse are slow cooked in a dutch oven with bacon and baked beans over the coals of a campfire and puddle ducks are plucked and roasted with apple or honey glaze. Do you ever run into birders while you're hunting? What do you see as the differences between birders and bird-hunters, and what do you think about those differences? Sadly, I rarely see others out and enjoying the great outdoors like I have seen in decades past. It is unfortunate that a high percentage of kids these days do not seem connected with the outdoor like they used to. If you get a chance read “Last Child in the Woods” by Louv it is a wake-up call. There are many similarities; both sets of individuals are “hunters” one group simply uses a camera and the other a gun. Both are serious about their respective sports and both are searching for opportunities to experience nature and the great outdoors in their own unique way. Unfortunately, both groups also have individuals that poorly represent their peers. I have meet inconsiderate hunters in the woods and I have also met inconsiderate nature watchers. Do you ever feel guilty for killing birds? If anyone says that while hunting they are never disturbed or “guilty” I would wonder if they are telling the whole truth. No ethical hunter ever wants an animal to suffer needlessly, however, there is nothing “planned” or “perfect” in the hunting world. Whether I get my steak wrapped in plastic and resting on Styrofoam from a slaughterhouse or direct from nature something ultimately had to die for me to eat it and no matter how you cut it this is not a “pretty” process. Eventually, if you hunt long enough something will disturb you and it is how you handle this pressure as a human being that will ultimately determine how and if you develop as a hunter. What was your most memorable bird hunt? I was fortunate enough to catch up to the stray Northern Wheatear that was discovered yesterday in Gray, Maine. It was at the top of Dutton Hill, a beautiful little blueberry-barren-topped knoll just off the turnpike. I showed up at 7:45 and was the only person there. I found the bird after about 25 minutes of nervous searching, and had great looks for the whole hour I stuck around. Just an absolutely beautiful morning. This is the first look at the bird, a nonbreeding adult [eds. note: Expert identifiers are now calling this bird a juvenile/1st year bird. Thank goodness for listservs!]. Here's some wheatear information. Check out how not-close they live to Maine! Key ID points here are the white rump, the white supercilium and the overall buff color. At one point the bird flew up to the top of a tree . . . an odd place for a bird that prefers tundra, beaches and grasslands. Oh it's a classic. A classic! Watch, and listen, to the Nike commercial below. Hear that noise around the :12 second mark, when Dirk's shot is in the air? What screaming call that must certainly have come from that Bald Eagle? As reported on A DC Birding Blog, Arizona has recently raised the cost of its recreational (i.e. birding and hiking as opposed to hunting and fishing) state park permit from $15 per individual and $20 for a family to $50 and $75, respectively. That's bad, but who gets hurt the most? People who can't afford the $50. Who's that? Well, in Arizona, it's likely to be Hispanics. According to this and this(.pdf), 1.5 million Hispanics live in Arizona, making up 28% of the state's population. The national poverty rate among Hispanics is almost twice the national average: 26.6% compared to 15.4%. Simple economics dictates that when you rise the cost of something, you will lose those consumers who are no longer willing or able to pay the new price. Although it's not something that pleasant to admit, birding is one of the least diverse activities there is. This great study, Relative Prevalence of African Americans Among Bird Watchers(.pdf), says that one of the major factors that keeps African-Americans away from birding is that they are less likely to be exposed to birding and birders as other people. The phenomenon is called the Don't Loop: when you don't meet people who engage in an activity you are less likely to participate in that activity yourself. African-Americans, like Hispanics, are another minority in this country with higher-than-average poverty rates. It's possible that a study on Hispanics and birding would find similar results. Raising state park fees by more than 300%, then, can only further disenfranchise Hispanics from birding by making is less likely that they can be introduced to or participate in the activity. For some, raising fees to state parks may be more than just an annoyance, but a barrier to experiencing public (yes, public) lands and outdoor activities.